The chaos in South Sudan after an alleged coup attempt on 14 December 2013 led to a diplomatic as well as military intervention by its neighbors. It was Uganda that went ahead and openly backed up South Sudanese president Salva Kiir a week later in his struggle to regain control in the youngest country in the world. A few days later, Uganda’s forces were included in an Intergovernmental Authority on Development (IGAD) mission that was set up. This raises the larger questions of how the East African security architecture looks like and where it is heading to in a fragile region as the famous commentator Charles Onyango-Obbo has done in the The East African Times. While a regional security architecture has been started to be in place since the 1990s, the region’s security institutions are still guided by the national self-interest of its members and not for the good of the broader region. Rebels, led by former vice-president of South Sudan Riek Machar, allegedly plotted a coup against the government and tried to take control over Juba. Uganda rushed into South Sudan with its military to defend its own interests, clearly to the unease of its neighbors like Ethiopia. Only afterwards, IGAD agreed to send a 5,500-strong intervention force to South Sudan and backed up the Ugandan army. By now, a shaky ceasefire was signed in Addis on 23 January 2014, and it remains to be seen which path this oil-rich country takes. On a more general basis, it seems to get ever more common that certain East African countries intervene unilaterally and only later on try hard to get the approval of the AU, IGAD, or the UN Security Council for their military action, not least to secure funding from the international community for their endeavor. Kenya did the same when its troops invaded southern Somalia to fight against the radical Islamist militiants Al Shabaab in October 2011 and officially joined AMISOM nine months later. In the meantime also Ethiopia joined AMISOM in October 2013. Another example is the UN Force Intervention Brigade in the eastern DRC that is now led by Tanzania that helped to fight back the M23 rebels and bring back some sense of security in one of the most instable parts of the world. Overall, Uganda, Kenya, Ethiopia, Burundi and Rwanda are militarily intervening in other parts of East Africa backed with resolutions of the UN or the AU, namely in the eastern DRC, Sudan, Somalia, the Central African Republic (CAR) and now also in South Sudan. Two Danish analysts argued that there is now increased confidence among policy makers that African solutions are needed to solve African problems. Countries in East Africa created a security architecture with no less than three regional organizations that deal with security in some form or another: the Intergovernmental Authority on Development (IGAD) mainly focusing on addressing drought and famine, the East African Community (EAC) tries to enhance trade and eventually even build up a political union with a own currency, and the East African Standby Force (EASF) with a military approach with military, police, and civilian components. Although these institutions could work hand-in-hand, the reality is different as internal politics and geopolitical calculations seem to prevent rather than enhance coordinated efforts. In general, there is a regional security mechanism network for East Africa out there. This has to be seen in the context of the emergence of an African Peace and Security Architecture (APSA) with the founding of the African Union (AU) in 2002. With APSA followed the establishment of five standby forces (ASFs) in Africa can participate in different scenarios including the intervention in cases of grave breaches of human security. It has also overcome the old doctrine of non-intervention with a new principle of “non-indifference.” Importantly, regional organizations should be integrated into the security framework and in fact be the main carrier of it. For East Africa this meant the establishment of EASBRIG which later became to be known as EASF. In the case of East Africa, also IGAD and EAC became part of the security architecture. With the establishment of the African Peace and Security Architecture (APSA) in 2002, the EASF joined this mechanism two years later but until today is very weak. Originally, it was placed under IGAD to be coordinated and established but now is only running on the basis of a memorandum of understanding. Kenya and other countries opposed the integration of EASF into IGAD because they feared Ethiopian dominance. Consequently, it lacks now the institutional meetings on highest levels of its member states which makes it weak in operating. It is also unclear when and how to deploy the Regional Standby Force (RSF) because there is no working mechanism in place. Thus, the EASF can only be deployed directly by the AU or as an RSF as long as all member states agree (which seems rather unlikely at the moment). Instead of coordination, the creation of the security architecture has been characterized by overlaps and competition as also IGAD and EAC used the APSA to expand their security ambitions. This is exemplified by the development of early warning systems for detecting and preventing regional conflict, a very important tool indeed. Every organization wants to have it to increase its importance for the international community, although all with a slightly different focus. In the end all end up with their own early warning system. Behind this rather absurd overlap are the powerful states in the region, although all of these states do not have the well-being of the region in their mind but first and foremost their national interest and use the regional security objective for their own good. Thus, on the one hand IGAD is perceived to be mainly influenced by Ethiopia while on the other hand it is Kenya, as an economic powerhouse, that is the main driver behind further integration in the EAC. At the moment, IGAD seems to develop ever more into an organization mainly focusing on the Horn of Africa while the EAC is focusing on the southern part of East Africa. Particularly Ethiopia is problematic with its “frozen conflict” with Eritrea and its stakes in Somalia and Sudan. To make things even more complicated, another big country, Tanzania, rather focuses its efforts currently on the Southern African Development Community (SADC) and its engagement in the eastern DRC is through them rather than an East African security organization. Uganda, on the other side is part of basically all regional initiatives but only tries to maximize its regional influence. In a region where none of the leading organizations are capable of safeguarding security on their own, this might make a lot of sense. In the meantime, the build-up of the EASF continues very slowly and it still needs to be settled whether the EAC or IGAD will take the lead to use the military capacities of EASF. There are still fears that military capabilities could be used to support the ends and means of East Africa’s more powerful states at the expense of regional stability and security. The good news is that there are a lot of institutions out there that are in theory dedicated to conflict prevention and conflict resolution. The problem is mostly their member states that rather follow national interest instead of giving in to a higher aim of regional security for its people. Overcoming this problem will be a huge task, because it is entrenched in the apparatus of all national governments and bureaucracies in the region. Sovereignty first, cooperation for regional development is most rhetoric that is hardly matched in reality. The overlap of three institutions which aim for the same goals is at the moment a task of duplication instead of cooperation. At the moment, it is IGAD that has the most developed security structures but its hands are largely tied due to its membership structure. It is the EAC that has the biggest potential in the long-run, even in the security sector. 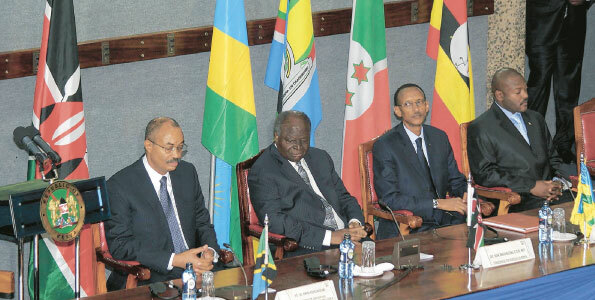 However, first of all, it would be necessary for the EAC to strengthen its organs. As there is not enough devolution to the headquarters in Arusha, the decision-making process is still very slow and bumpy because it is not easy to reach collective consensus. Particularly the EAC should be able to bring the security framework forward due to spillover effects of its economic prosperity to a broader stability in the region. This will be very important because unilateral interventions like the one of Uganda in South Sudan that only later on are pressed into regional efforts is not the way forward. Previous What is wrong with the UK? This is such a great assessment of the situation! Very informative! Well Joe, that is a great assessment of the situation in south sudan and the EAC security architect.I am very ok with all the efforts that are been made to resolve the present conflict in south sudan but what baffle’s me is that even the best conflict analyst has failed to come out with the root cause of the conflict and the present insecurity in the EA region. my fears grounded on that fact that this entire region remain very volatile ,,,Is it military or political intervention that is needed in south sudan? is the international communities cleared in their intentions and motives of intervention? can south sudanese themself solve their problem as they had done before?. Dear Umarou, these are indeed very good questions and your concern is more than valid. I am just afraid that there is not just one root cause but a multitude of them. In general it comes down to the fact though that none of the governments is yet able to deliver basic services for all of its citizens (not even Kenya). In the case of South Sudan, it is a power struggle of the elite. Uganda always backed up president Kiir and unilaterally has done so another time. Only afterwards IGAD approved Uganda’s step. That is certainly problematic and not in the spirit of regional cooperation. South Sudan currently does not seem to be able to solve their problems on their own. The power struggle of the elites, backed up by the military or militia groups, is indeed very unhealthy. In short, the government of South Sudan has failed to deliver the most basic services since independence. Of course, the difficult relationship with Sudan made it not easy, however the amount of corruption that is reported certainly has contributed to the deterioration of the situation. The EAC security architecture, however, certainly has to focus a lot on the civilian component – and rightly so. Because particularly among the pastoral communities there is often a lack of resolution mechanisms. The resolution mechanisms are there though and need to be actively supported and strengthened. If such a grassroots approach would be structurally implemented throughout the society, I think a lot of insecurity would be solved because there is much more accountability and thus more equality. What do you think? Would that be possible?